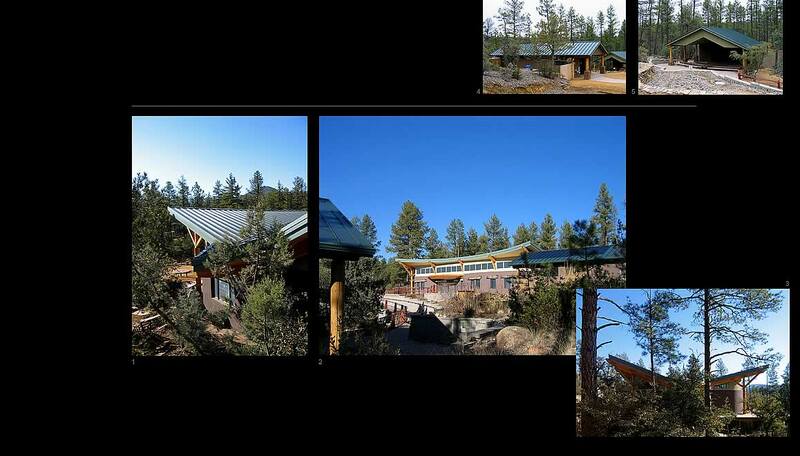 The 80 acre site was provided to the Highlands Center as a long term lease from the Prescott National Forest. Careful integration with the existing buildings, as well as with the densely forested site, was a paramount consideration for the building’s placement and design. Though the new building form is a dramatic departure from the existing structures, similar materials, finishes and colors (wood, stucco, and metal roofing), help contextually integrate the new building with its surroundings. The vertical log support structure echos the many pine trees which surround the building site (image below & left).